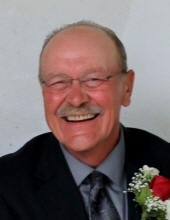 James T. Dickrell, 66, Milladore, passed away on Tuesday, January 29, 2019 at Aspirus Wausau Hospital. A Mass of Christian Burial will be held at 10:30 am on Tuesday, February 5, 2019 at St. Wenceslaus Catholic Church, Milladore, with Rev. John Ofori-Domah officiating. Catherine Warnecke will be organist for St. Wenceslaus Senior Choir and Karen Shirek as soloist. Burial will take place in the parish cemetery and members of the Junction City Lions Club will serve as pallbearers. The visitation will be from 4:00 pm until 7:00 pm on Monday at Martens / Rembs Funeral Home, Junction City and from 9:30 am until service time on Tuesday at St. Wenceslaus Catholic Church. James was born on July 24, 1952 in Marshfield, to Lloyd and LaVerne (Gross) Dickrell. He married Joan M. Wotruba on January 12, 1974 at St. Wenceslaus Catholic Church, Milladore. Jim was a licensed cheese maker, working as a cheese grader at Schreiber Foods in Wisconsin Rapids for 27 years until his retirement. He is survived by his wife, Joan, 2 daughters and 4 grandchildren, Tracy (Aaron) Zuehlke and their children, Aden and Emma; and Kelley (Derek) Rehm and their children, Elliott and Olivia. He is also survived by siblings, Ronald (Joni) Dickrell, William Dickrell, Betty (John) Jazdzewski, Dennis (Debbie) Dickrell, Gary (Cara) Dickrell and John Dickrell and a brother-in-law, Bill Wotruba. He was preceded in death by his parents and a brother, Richard. Jim was an eye donor and in lieu of flowers, memorials may be designated to the Junction City Lions Club Scholarship Fund. "Email Address" would like to share the life celebration of James T. Dickrell. Click on the "link" to go to share a favorite memory or leave a condolence message for the family.